Little Bambinos – Learn through play! There is a place where laughter always fills the air. At Little Bambinos we understand that raising a child in today’s busy world is no easy task. We can help by supporting your child’s learning and well-being during these important early years. Research shows that children learn most successfully when families and educators work together. So, we want to get to know you and your family, and we want you to get to know us well too. We work closely with families to build positive and meaningful relationships to help us create a caring environment, where every child is valued, and their abilities, interest and routines are respected. 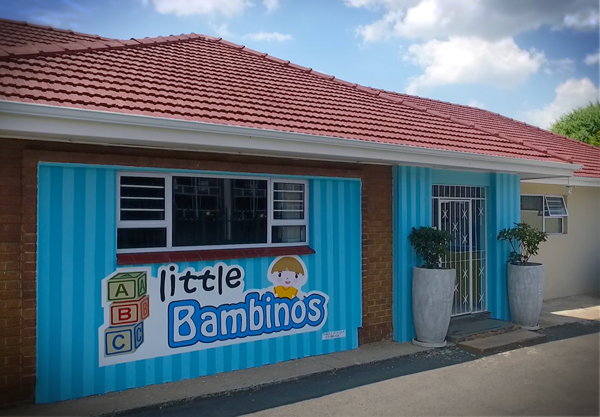 In same way, there’s a real sense of community spirit in Little Bambinos, and our people build strong partnerships with local schools, organisations, charities and businesses. It’s important for you to know your child’s is in a caring environment with experienced educators and teachers. That’s why the people who work at Little Bambinos are not just qualified but have real love of children as well. Our educators and teachers are qualified in early childhood education and have considerable early learning experience. Children start learning from the moment the are born. They are curious, creative and intensely interested in themselves and the world around them. Recognising that children are capable and confident learners is at the heart of how we approach early learning at Little Bambinos. Our approach draws from some of the world’s most respected and innovative thinking and research on early childhood education. Along with caring and qualified educators, effective learning requires a rich and stimulating environment that we want them to engage with and explore. Children have a natural drive to explore. They use different tools to communicate and different ways of making their wants and needs expressed, which shows that they are capable and confident learners. At Little Bambinos, we aim to honour and value each child, their strengths, interest and opinions. Our program is based on the South African Early Development Learning Framework. We believe that all children have the right to an education that lays a foundation for the rest of their lives, maximises their ability, and respects their families, culture, languages and identity. Best school ever! AWESOME staff, children & parents! Such a loving family atmosphere. Love the school to pieces! Best school ever. The teachers are amazing and my daughter just loves everything about the school. Thank you Little Bambinos. Excellent school!!!!!!! I will recommend this school to anyone! My children loves it there and loves going to school everyday! Best school EVER! Amazing school, great teachers and managers. I am so grateful for Little Bambinos, keep it up!! !